****** Get your tickets to the 5th Annual New Year's Eve Gala 2019 at Safari Texas Ranch! ****** Congrats to the winners of the 7th ANNUAL BOLLYWOOD PAGEANT INTERNATIONAL 2018!! Learn Bollywood dancing with flavors of different Indian dance styles like bhangra, classical and folk dancing. Whether you are a beginner or have experience in Bollywood dancing, this is a fun way to enjoy the cultural experience with other folks! We offer classes for all age groups. Our classes are casual,informal and lot of fun! The combination of steps taught will strengthen the dancer's awareness of musicality,timing,spacing and precision. You'll get a good workout while learning some new choreography that you can show off to all your friends! We currently have on-going classes in Houston, Texas, but are constantly conducting workshops across the US. So If you haven't attended one of our classes, look out for our classes/workshops in a city near you! You can also submit a request for a special workshop or class in your city! CALL US FOR YOU NEXT SPECIAL EVENT!! Listen to Bollywood Shake Radio ONLINE 24x7! ​Enjoy some great Bollywood music and entertainment!! You could join our team of talented instructors! We are looking for talented and experienced dancers to join our fun and dedicated Bollywood Shake team. We currently have classes in Austin and Houston, but we would love to hear from you if you would like to start classes in your area. Please contact us to schedule an interview/audition. 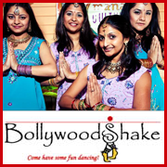 Bollywood Shake will be opening locations in cities across Texas and in other parts of the US very soon! If you're interested in opening a Bollywood Shake Franchise or applying as an instructor in your city contact us. We would love to talk to you!! Ruchika and her team of experienced instructors have specially designed the Bollywood Shake Fitness Instructor Training Program to share what they have learned through their success at Bollywood Shake with other instructors who share the same passion! Through the Bollywood Shake Instructor Training program, instructors all over the world will have access to proprietary Bollywood Shake training materials, song lists and choreography which they can incorporate into their own classes. So whether you're an aspiring Bollywood instructor or an experienced instructor, this website has training materials, song lists and choreography to help you along the way to becoming a star instructor!! Be the first to recieve our monthly newsletter and find out about workshops, performances and other exciting events!